Well again, not a very flattering picture. Methinks the camera batteries need changing. Pretty lame excuse, huh? Youthinks the photographer needs changing. Methinks maybe youthinks right. 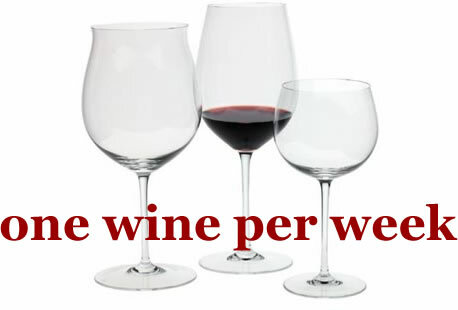 And also, again, the wine of the week is a wine that cost $7.99, and from the L.A. Wine Company. You might be surprised to know that I have only one more $7.99 wine sitting among the Sweet 16, given how it seems all the wines of the week happen to be at that price. 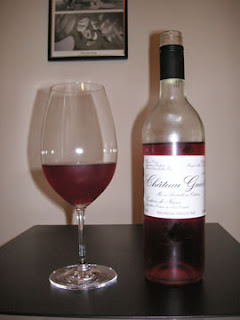 Despite the picture, the color of this 2006 Château Guiot Costières de Nîmes Rosé was an attractive cranberry. The predominant aroma I sensed was strawberry pie with whipped cream, along with an underlying mineral/gravelly component. Taste-wise, I got a mixture of sourish-cherry and cranberries, watermelon, and again the gravelly mineral component. There was more of that stony mineral in the somewhat tannic finish. Acidity was crisp and in balance. Overall this was an interesting wine, with perhaps just a shade too much of a mineral aspect compared to the fruit, but I thought it was pretty tasty. Two thumbs up, good QPR. Knockoff Wines - Y Pay More? Hottest Wine Bar in the World? Invasion of the "Undocumented Grapes?" Points Say the Darndest Things!